Dr. Gurnam Saini is a successful, knowledgeable and properly accredited Ayurvedic clinical practitioner from India, the birthplace of Ayurveda. He has lots of success stories behind him. He is a graduate in Ayurvedic Medicine and Surgery (BAMS) from Baba Farid University of Health Sciences, India. BAMS is a 6-year full-time campus course, which includes 1 year of internship training. Since his graduation in 2005, Dr Gurnam practiced in India for 2 years and efficiently handled more than 1000 medical conditions. Dr Gurnam Saini offered effective treatments to a large number of people when he worked in one of the busiest and most well known Ayurvedic Hospitals in India. This experience made it easier for Dr Gurnam to fine-tune his expertise to determine health conditions and provide useful and proper remedies. Dr Gurnam has completed a Post Graduate qualification in Mental Health Nursing from Latrobe University, Melbourne and had worked part time as an Associate Nurse Unit Manager in Eastern Heath in Melbourne Victoria. 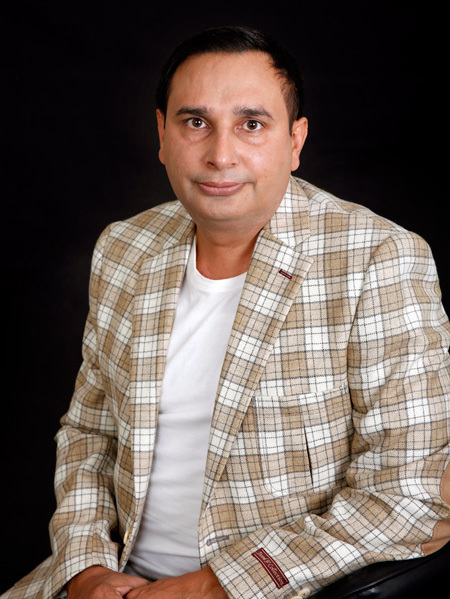 Dr Gurnam Saini is dedicated and enthusiastic about Ayurvedic Medicine, Naturopath treatments and also is constantly researching the scope of this conventional Indian system of medicine for the reduction and cure of a growing number of medical conditions. Dr Saini’s mother has also taught him so many useful recipes, therapeutic uses of different herbs and spices, and other natural remedies to deal with different health issues since his childhood. Dr. Gurnam’s father was an army officer and mother was a housewife. So he adopted the qualities of devotion and hospitality from his generous father and practices these qualities with his patients, without giving preference to financial gain. He has inherited his passion to serve others without any self-interest from his parents. Dr Gurnam Saini not treats patients in the clinic, but also supports them with advice and strategies to deal with every day health problems. According to Dr Saini, serving others is a passion, rather than just a profession. Dr Gurnam has over 15 years’ experience in (Naturopath treatment), and is considered to be one of the most highly sought after Ayurvedic Physicians in Melbourne Victoria, he has also received numerous awards for his groundbreaking work to increase the profile of Ayurveda not only within Australia but globally. After migrating to Australia in 2007, Dr Gurnam started his clinic in a single room in the eastern suburbs of Melbourne. His Wantirna practice quickly became popular and successful, to such a degree that there was demand to expand their business to a bigger premises in Northcote, Melbourne in 2015. Since moving to Australia and setting up a distinctive holistic Ayurvedic centre for several years, he has already served thousands of people with their different health issues. As a result of their naturopath and Ayurvedic treatments, many customers feel they have acquired a new life with a much healthier, more energetic body and sharper mind. For over half a decade Dr Saini’s “Pure Herbal Ayurved Clinic” has served as a relaxing place for Ayurvedic therapies. People visit to seek support for their health problems, physical discomfort, find psychological freedom, energize themselves and connect to their internal spiritual life. He is also an expert in the treatment of chronic wounds, women's disorders, skin diseases, problems of the digestive system, lifestyle problems, chronic disease, joint problems, and children's health. Ayurveda or Naturopathy is the science of life, focused on the upkeep of health, improving total wellbeing, the prevention of sickness along with the cure of ailments. In contrast to other systems of medicine, which deliver only symptomatic treatment methods, Ayurveda focuses on dealing with the actual cause of disease. Gurnam Saini is fully skilled and registered specialists of well-known organizations like Australasian Association of Ayurveda Inc- (AAA) as Ayurvedic Consultant and Australian Health Practitioner Regulation Agency (APHRA ) as Mental Health Nurse. His consultations are knowledgeable and are highly recommended. This is measured by the high number of returning clients for on-going treatment and their recommendations to friends and family members, who are also choosing to visit him. Dr Gurnam Saini examines patients using ayurvedic principles of Body Constitution Analysis, Pulse and Tongue Diagnosis. His treatment plans involves either the dispensing of medicinal herbs, a modified diet regime, lifestyle modification, yoga, meditation and Ayurvedic detoxification making use of classic Ayurvedic and Naturopath therapies. Dr Saini’s Pure Herbal Clinic located in Northcote, Melbourne offers professional Ayurvedic treatments for Arthritis, Endometriosis, Vitiligo, PCOS, IBS, Psoriasis, Lyme disease, Low back pain, Cervical spondylosis, Weight loss, Obesity, Digestive complaints, thyroid problems, Mental health, Chronic fatigue syndrome, Rejuvenation, Ayurvedic skin care and Panchakarma cleanse and detoxification. Pure Herbal products and oils are chosen according to individual body type after a complete Ayurvedic body type analysis. With particular conditions, your Ayurvedic specialist may also suggest a Panchakarma (detox) Ayurvedic cleanse and/or an Ayurvedic massage to support you in your individual treatment plan.